This weekend Brandon and I were in Memphis for Games Workshop’s convention, Games Day. 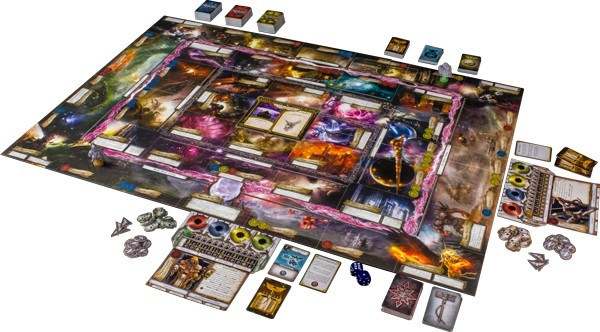 I’ve been very excited about Full Control’s version of Space Hulk. 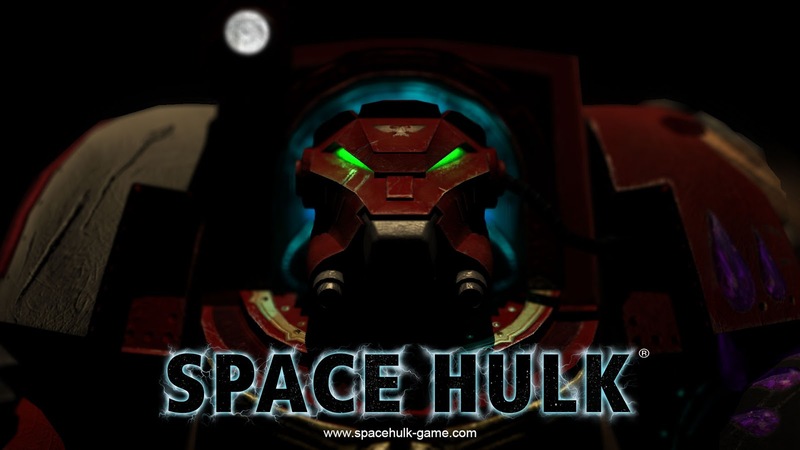 Space Hulk was a board game originally released in 1989. It borrows heavily from the paranoia and endless hallways in Alien. 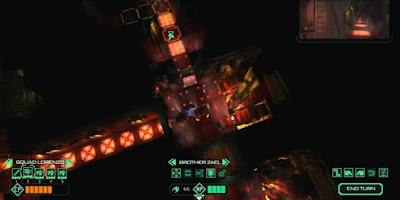 You control a squad of Blood Angel Terminators as they investigate ancient ships or asteroids. Hidden in all of those corridors are Genestealers, four armed xenos that would love to devour the Blood Angels. It’s a very difficult game but it’s also very fun. Full Control had demo stations set up and I jumped into the first seat I saw available. There were a number of small demos to choose from, but as soon as the person running the demo said the second mission had the flame thrower I knew I had to try it. The flamer is very, very satisfying. From what I saw, the game is also pretty clunky. During the game I was playing I had to break down a malfunctioning door. I walked my marine up to the door and hit the button to swing my power fist. I looked at the screen in confusion. Did I hit the door? Did I miss? After two or three hits the door did break open, but until then I wasn’t sure my actions affecting anything. It is entirely possible that there is some form of dialogue box that was hidden during the demos. I only got a few minutes with the game instead of going through all the tutorials so it is very likely I am missing something. Cyanide’s version of Blood Bowl hid all of the good stuff too, but it is possible for players to display all the rolls behind the game’s animations. 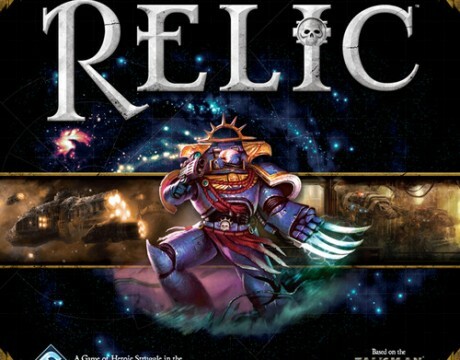 I’m hoping Space Hulk will do the same. The game is currently up for pre-order on Steam for 29.99 and the mobile version will be following at a later date. 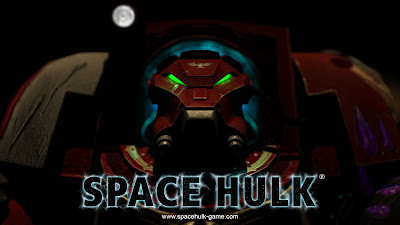 Expect multiplayer and the ability to create your own levels. I didn’t love it as much as I wanted to, but the game is still a pre-order for me. By the time you read this I’ll already be gone. I’m taking Brandon with me. Actually the two of us are going to hang out at Games Day in Memphis. Hopefully there will be plenty of cool things that we can report back on, but if it is anything like last year we’ll probably just wander around and get really drunk. If you’re going to the convention and see us stumbling through the halls make sure to say hello. I won’t have the Stoutheart Brewers with me. I thought about it, but I don’t remember seeing any Blood Bowl taking place last year. James Bond has had a lot of famous cars. My personal favorite will always be the white Lotus Esprit used in “The Spy Who Loved Me.” The car meets an explosive end during an early scene in one of my favorite Bond movies, “For Your Eyes Only.” At that point it is replaced with a red Lotus, but there was something about the look of the white one that I loved. And that was before it turned into a submarine. On September 8th the submarine version of the Lotus will be auctioned off by RM Auctions. The Lotus submarine is expected to go for close to a million dollars. 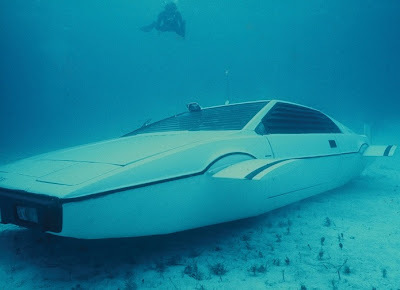 While it wasn’t the only car used in the underwater shots it was the most important one. When Bond drives his car under water the Lotus’ wheels retracted (that was one car) and then fins extended out of the wheel wells (that was another car). The car up for auction is the third underwater car, the one that actually drove. The Lotus sub didn’t actually keep water out, so the person really driving it during the filming had to wear full scuba gear. It also doesn’t convert. Despite its looks it’s strictly an underwater vehicle. The craziest thing about the story is the owner of the car bought it in a storage locker auction way back in 1989. He paid 100 dollars for it. Gwar has just released the first song from their upcoming album Battle Maximus. The song is called “Madness at the Core of Time” and the full album will be available on September 17th. Battle Maximus will be the band’s first album since the death of Cory Smoot, aka Flattus Maximus. While Cory was the last of a long line of people to play the role, he played the role the longest. The band decided to retire the character with Cory’s passing. In the Gwar mythology Flattus has taken a spaceship and returned to “Planet Home”. New guitarist Brent Purgason (formerly of Cannibal Corpse) debuts on this album as Pustulus Maximus. Pustulus is supposed to be Flattus’ cousin. Long time on-again, off-again band member Casey Orr will not be returning as Beefcake the Mighty; instead Beefcake will be portrayed by Jamison Land. Orr has left Gwar for other projects in the past and always returned, so I hope this leave is temporary as well. One of the things I love about my birthday is that it falls either during or very close to Discovery Channel’s shark week. This year it will be starting on August 4th. I complain that every year Discovery is losing their focus on conservation and that they need to showcase more sharks than just the great white, but then I prove myself to be a giant hypocrite and watch every second of new programming regards of what it is about. I’m a weak person and I can’t deny the chance to watch sharks (other weaknesses include Komodo Dragons, non-cartoon Tasmanian Devils, and fire). 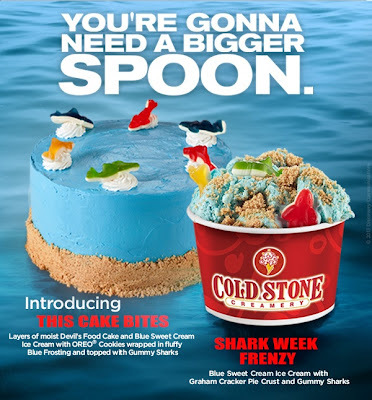 This year Discovery channel and Cold Stone Creamery have come up with the perfect treat to eat while watching Shark Week. They’ve frozen buckets of chum and dipped them into…no that’s not right at all. Actually they’re taking blue sweet cream ice cream, mixing it with graham cracker pie crust, and adding gummy sharks. In the even bigger cake form they’ve added devil’s food cake and Oreo cookies to the mix. I haven’t tried either of these yet, but they probably taste a whole lot better than a bucket of chum. Here's hoping that there is a good special on hammerheads this year, because that'd make a pretty cool birthday present for me. Today’s art wasn’t actually in a sketchbook. Instead it is a commission I had done right before Star Wars the Old Republic came out. The Lazy Krayt Shipping Company was the name of a smuggler focused guild in the Bioware MMO. Krayt Dragons are large lizards that are native to the planet Tatooine. So the name is a little punny. Joel’s drawing fit what I wanted perfectly. It brings up memories of Snoopy sleeping on top of his dog house. Sadly I got pretty bored of the Old Republic after I finished the Smuggler’s main story and I haven’t been back since. I still love the idea of the Lazy Krayt Shipping Company and I’d like to use it for something else. I’ve long ago realized that writing Star Wars fiction may be a good writing exercise but is pretty much a waste of time. Someday I’ll probably take the Lazy Krayt idea and recycle it into a setting of my own, I like it too much to let it just sit on a shelf. 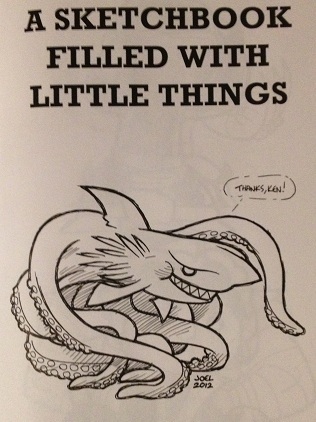 Today’s Joel Carroll update was done inside another of Joel’s sketchbooks, A Sketchbook Filled with Little Things. You can’t talk about my favorite things without mentioning Sharktopus. The strange concept, the horrible CGI, and the amazing theme song are all things that I just can’t get enough of. I chose Sharktopus for today’s update to remind everyone that SyFy’s most recent shark movie, Sharknado has an encore showing tonight at 7pm. I’m always torn by cheesy shark movies. I love sharks; I don’t want to see them vilified. On the other hand, I can’t get enough of seeing them take down people. I think Discovery has lost its way with their Shark Week programming. That conservation message is still there, it’s just getting harder to see through all of the Great White programming. Today’s piece was done inside Joel’s sketchbook ephemera. The piece is of my favorite giant robot, GaoGaiGar. I did a two part write up about the first episode of GaoGaiGar that can be found HERE and HERE. 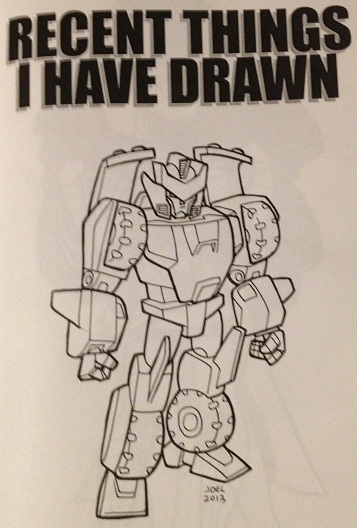 The King of the Braves is made up of a robot lion, a drilling vehicle, a stealth bomber, and a bullet train. If you think that sounds ridiculous and awesome you’d be correct. By the time it was finished, GaoGaiGar had a pretty large cast of robots. One day I’d like to get Joel to do a larger piece with all of the GGG bots in it. Since almost all of them combined with at least one other robot it’d be hard to choose if I wanted them as individuals or in their combined form. I’m cheating on the today’s entry; it’s a piece that has already been on That F’ing Monkey. This is a page from my Brain Jar sketchbook and features Indiana Jones and Short Round. In all seriousness I’m a huge fan of the Short Round character. Before the Crystal Skull a lot of people gave Temple of Doom crap for being the worst of the Indiana Jones trilogy but I never saw it that way. Keep your Sean Connery I’ll take Jonathan Ke Quan. 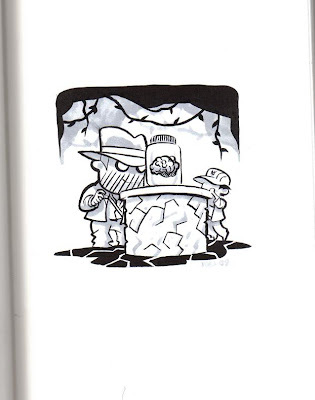 Anyway, Joel had done some sketch cards for an Indiana Jones card series. When I saw the characters stylized like this, I knew I had to have one with Short Round. Another day, another Kickstarter. I have talked about how much I enjoy the world of the Iron Kingdoms, as depicted in the Warmachine tabletop and roleplaying games. 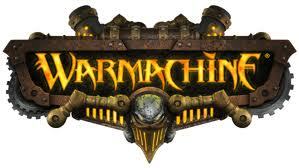 Well now they are venturing into the video game world with Warmachine: Tactics. Tactics is a turn based strategy game that is currently on Kickstarter. They have blown through their funding goal on the first day and have also nabbed some stretch goals. Personally I am looking forward to the 850 thousand goal as that is when I get the Thunderhead, a kickass Cygnar 'Jack. Anyway check out the kickstarter and preorder the game that is expected out next year around this time. Also if you are interested in some Iron Kingdom fiction, Privateer Press has launched a fiction line called Skull Island Expeditions. I really enjoyed The Way Of Caine. Allister Caine is a Cygnarian Warcaster with a penchant for shooting people in the face. This song below is written by Mark Crozer and used by the Wyatt family as entrance music in the WWE. Originally it was called “Broken Out in Love” but it has recently changed its name to “Live in Fear”. I’ve been seeing the Wyatt family for the past few months at NXT’s tapings and I’m thrilled for them to get called up to the main roster. Their entrance this week on Raw may have been one of the best things I’ve seen in a long time. Thursday night is going to be packed with movie greatness and I wanted to make sure everyone knew what was coming so they could prepare in advance. 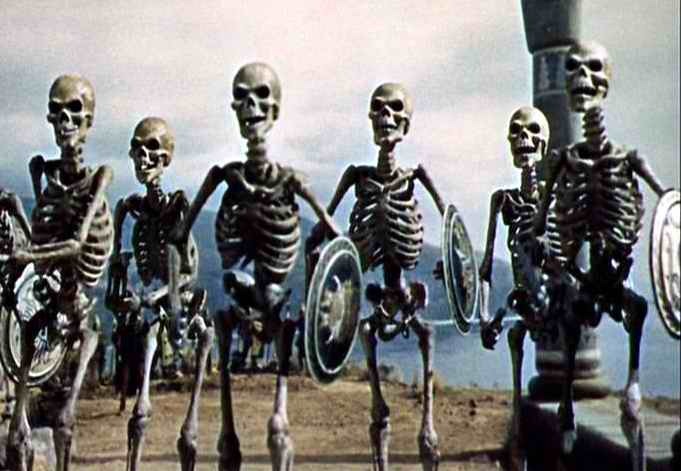 Turner Class Movies is having a memorial tribute night to Ray Harryhausen. Harryhausen was a master at stop motion animation and they have some of his best work lined up. At 8pm it all starts with the classic Jason and the Argonauts. You’ve seen the skeletons with their shields and their swords, now see the whole thing. Seriously, I love those guys. At 10pm is The Golden Voyage of Sinbad. Followed at 12am by Sinbad and the Eye of the Tiger. If you’re up for staying up really late or are setting up your DVR Earth Vs. the Flying Saucers is on at 2am and The Beast from 20,000 Fathoms is on at 3:30am. If you want something more modern there is Syfy’s premiere of Sharknado. 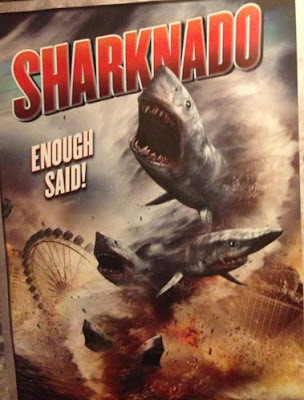 If you think Sharknado sounds like a tornado full of sharks you’d be right. Why is there a tornado full of sharks? Because it’s awesome. Because it’s cheesy as all hell. Because it’s a Syfy original movie. I can’t resist a bad shark movie, it’s a weakness of mine. I don’t know who is coming up with movie ideas over at Syfy but I hope they never stop. 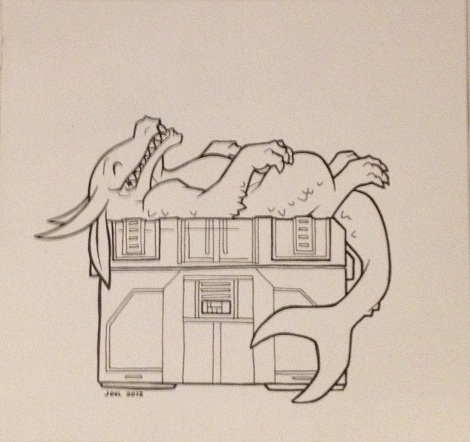 In April we posted about Ed Kramer and his ties with Dragon*Con. You can read that update HERE, but the short version is that I no longer felt I could support the convention with my own money if it would benefit someone like Ed Kramer. I certainly wasn’t alone, a lot of voices felt the same way. Yesterday Dragon*Con updated their Facebook with the statement below. Thanks to all of our fans, guests, and volunteers for your support! DRAGON CON, INC. REPLACES DRAGON CON / ACE, INC.
Dragon Con will Continue the Agreements With Hotels, Guests and Performers. 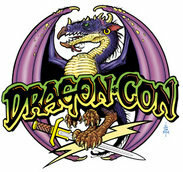 ATLANTA – July 8, 2013 – The Board of Directors and Shareholders of Dragon Con / ACE, Inc., producer of Dragon*Con, Atlanta’s internationally known pop culture, fantasy and sci-fi convention, have agreed to merge the company into Dragon Con, Inc. (Dragon Con) in a cash-out merger. Dragon Con will continue the agreements with each of the host and overflow hotels associated with the convention as well as all of the guests and performers scheduled to appear at this year’s event, either “as is” or with amendments recognizing Dragon Con as owner. This is great news for everyone who has been following the story. Maybe Kramer finally caved to the other Dragon*Con owners, maybe the backlash finally started to threaten their paychecks; I don’t know why or how it finally happened and I don’t care. Happy Flash Friday everyone! Today’s update is pretty short, because I don’t really have a lot of Flash material planned for today. But I did run across a new T-Shirt solicitation that I wanted to talk about before I had forgotten. This isn’t the first time that Francis Manapul’s fantastic art has been on a shirt. I think this one really shows off his unique layouts. 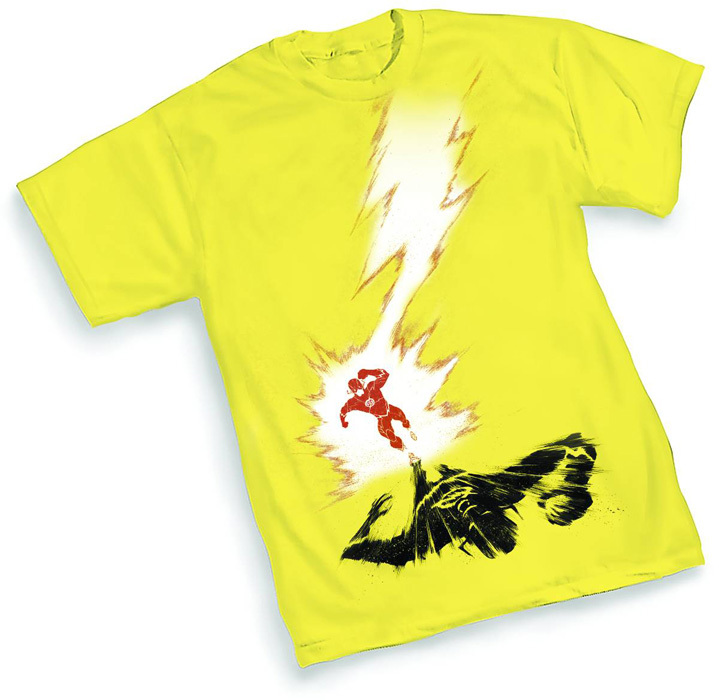 It’s a yellow shirt which will be a turnoff for a lot of comic fans. I’m the same, the majority of the shirts I own are black or grey. The only reason there are red shirts in my closest are because of the Flash and the Detroit Red Wings. If yellow is your color, this shirt is showing up for pre-order on comic sites everywhere. 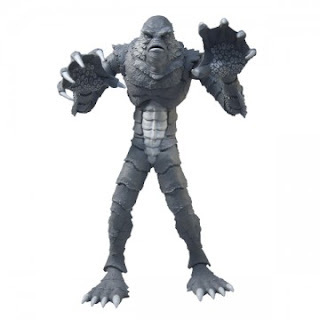 I am always happy to see quality merchandise based on the Universal Monster properties. The quality part of that statement is the most important part. I’ve seen numerous figure launches that have just made me cringe. 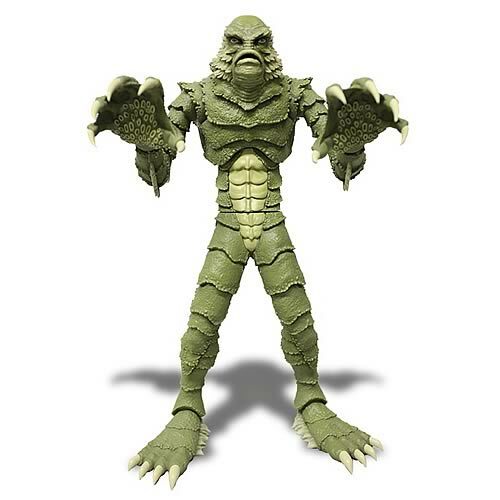 Currently Mezco is releasing a 9 inch stylized figure of the Creature from the Black Lagoon that has me really excited. The 30 dollar figure has 11 points of articulation so you should be able to get some decent poses out if it. It is a stylized version, but I dig the design they went with. It isn’t so extreme that you can’t tell what it is supposed to be. Sadly there isn’t a bathing suit clad Julie Adams to go along with the figure but I can see this one ending up on a shelf at my house. Mezco is one of those companies that is going to get as much use out of a mold as possible. So they also have two limited edition versions of the Creature figure. 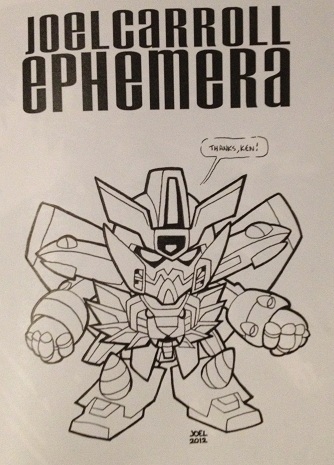 The first is the black and white version, so he looks more reminiscent of his screen debut. The second is a glow in the dark version, which is a nod back to the old figures that used to come in the same glow in the dark material. Both of the limited versions were about double the price of the normal and are already getting difficult to find. When Transformers first introduced figures that combined to make larger robots it was incredible. I still remember my cousin getting Devastator and being in awe of it. Seeing the constructicon’s success the Transformers quickly started releasing more combiners. It was very formulaic; one bigger robot was the torso and the smaller ones created the arms and the legs. That all changed with Predaking. 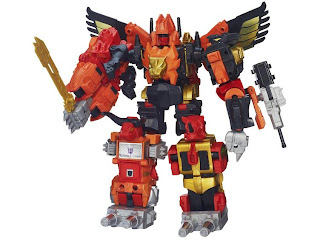 Predaking was made up of full sized Transformers, so he towered over the others combiners. Sadly, he was also very expensive. 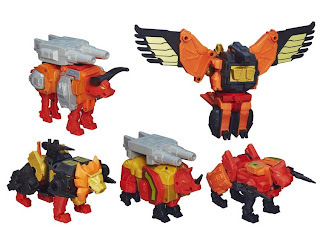 I was lucky enough to get three of the Predacons, so my Predaking was sadly without legs. In my mind he just used the wings on his back to fly around and punch things. He didn't let the lack of legs keep him from wrecking face, because that's the kind of bot he was! A re-issue of Predaking is currently for pre-order over at Big Bad Toy Store. 120 dollars will get you Divebomb, Headstrong, Rampage, Razorclaw, and Tantrum. Sure 120 dollars is a lot, but considering you get five figures in the set it is a pretty fantastic deal. Part of me wants to order it just so I can finally have a full version of this monster.